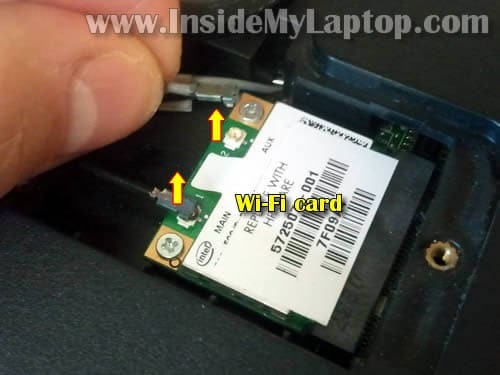 Loosen six screws securing the Wi-Fi and Hard drive/Memory covers. My HP pavilion dv8 had two hard drives installed. By the way, they are regular 2.5″ SATA HDDs. Disconnect the hard drive cable from the motherboard. 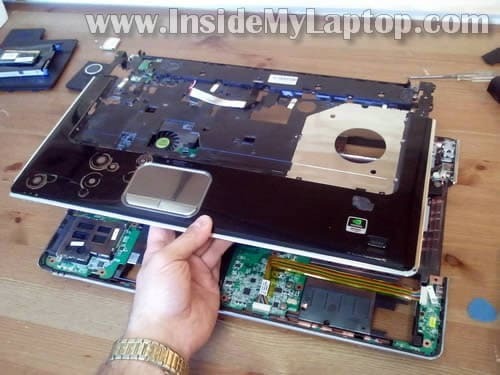 Lift up and remove the whole HDD assembly. Also, you can see the CMOS battery. 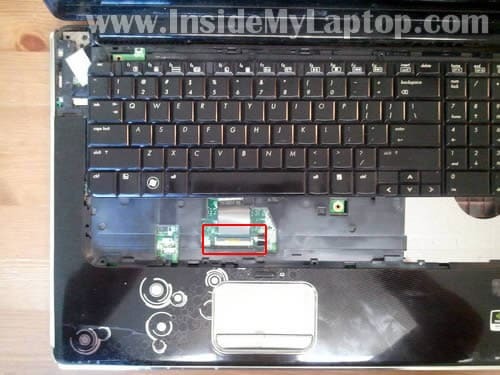 HP Pavilion dv8 has two memory slots and both slots accessible though the door we removed in the step 1. In order to remove the memory module spread latches on both sides of the memory slot. The memory module will pop up at a 30 degree angle. 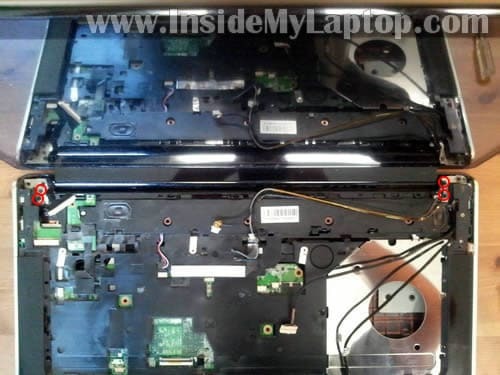 NOTE: in my laptop the DVD drive face plate was missing. 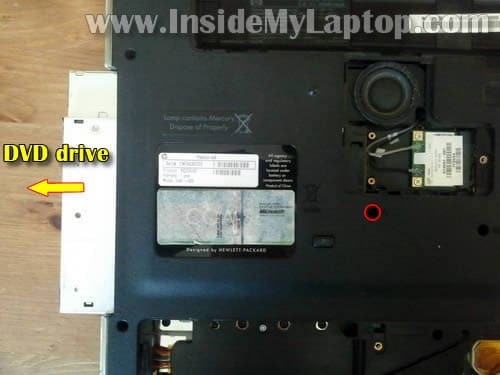 Normally, the DVD drive will have the face plate attached to the front of the drive. Remove six (red) screws securing the speaker cover. Remove two (yellow) screws securing the keyboard. Carefully lift up one side of the speaker cover with a sharp object. Remove the cover with your fingers. Carefully lift up one side of the keyboard bezel. Continue separating the keyboard bezel from the base. Be careful, the bezel has LED board built in. There is a cable connecting the LED board to the motherboard. Turn the keyboard bezel upside down so you can access the LED board connector underneath. Here’s how you unlock the LED board cable connector. Move the brown tab about 2 millimeters to the direction shown by two yellow arrows. DO NOT move it any further. The brown tab must stay attached to the connector base. Now you can pull the LED board cable from the connector. 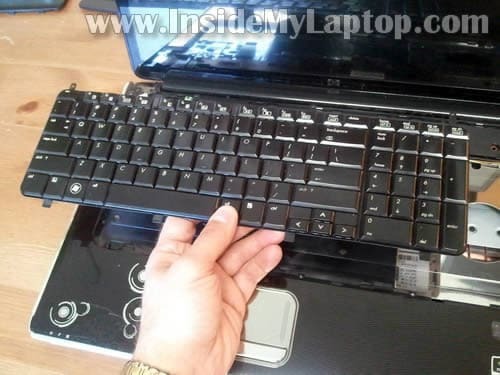 Lift up the keyboard and move it towards the LCD screen. Now you can access the keyboard cable connector underneath. 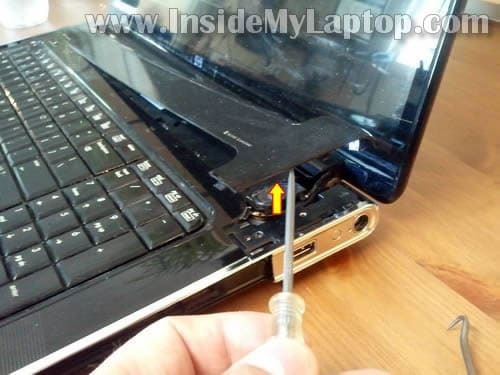 Before you remove the keyboard, it’s necessary to unlock the connector and release the cable. 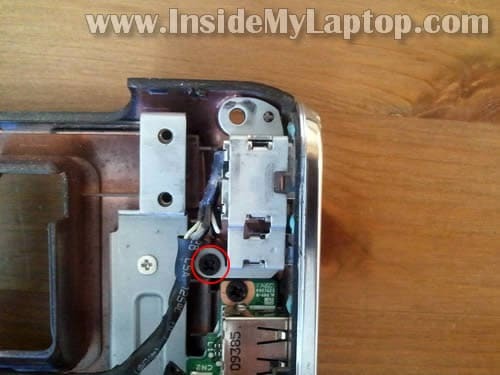 In order to unlock the keyboard cable connector lift up the outer side of the brown tab at a 90 degree angle. – DC jack (power) cable. – Pull wireless card antenna cables though the opening in the top cover. 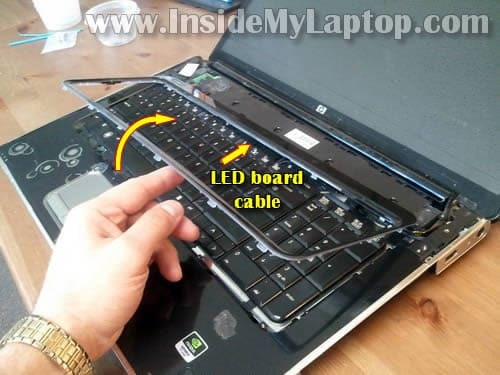 – Touch pad board cable. – Touch pad on/off button cable. 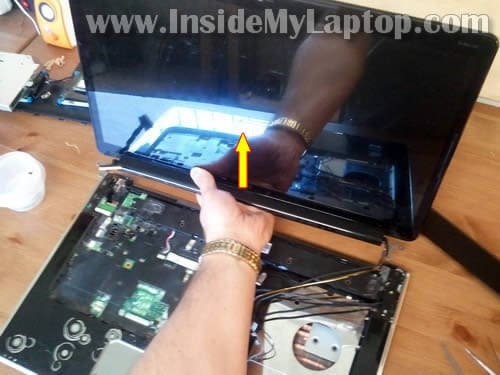 When you lift up the top cover don’t forget to disconnect the finger print device cable (pointed with yellow arrow). As you know, my goal is replacing the DC jack which is located in the upper right corner. Remove one screw securing the metal bracket to the bottom case. Finally, lift up the DC jack. 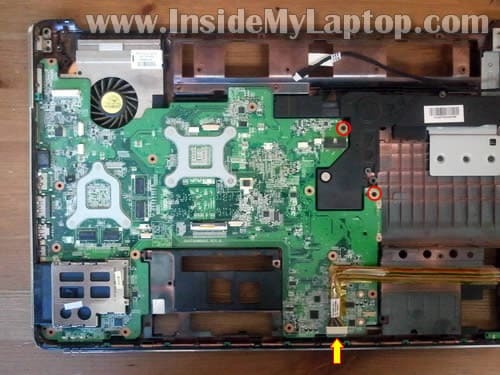 As you see, in HP Pavilion dv8 laptop the DC jack is not soldered to the motherboard. It’s attached to the harness. We unplugged the DC jack harness from the motherboard earlier, in the step 19. Now you can remove the failed DC jack and replace it with a new one. Instead of buying just the DC jack itself, I would recommend buying the whole harness (jack and cable). In this case you don’t have to solder anything. I’m not going to disassemble this laptop any further but it shouldn’t be difficult. 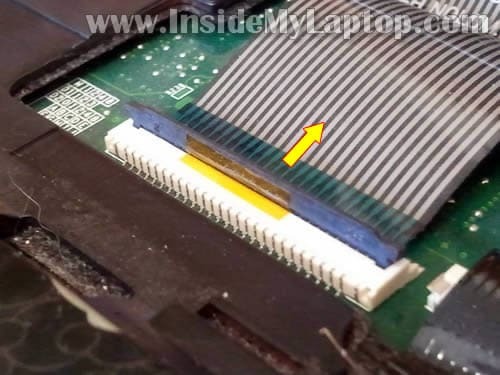 In order to remove the motherboard you’ll have to remove two screws and disconnect one cable (maybe more cables if you have a different Pavilion dv8 model). 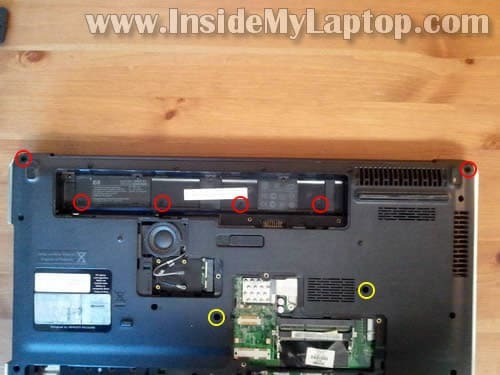 The cooling fan can be accessed and replaced only after the motherboard is removed. If someone knows how to open and clean the fan of Samsung R519 I will appreciate it. Do I need to work all the steps that you have made? I made a mistake in step 17, I broke the black part of the port (the locker), is there any way to find a replace of this?. I asked to a dealer in my contry but they say that the part is only avaible whith the entire mother board wich is useless for me. I have a question, did you take a look at the HDMI port? Could you tell me how it is connected to the motherboard? The HDMI port soldered to the motherboard. Thanx for the quick reply. Geuss that means fixing it my self isn’t a option. Is there a way to identify the motherboard with out taking it completely apart? Is there a way to identify the motherboard with out taking it completely apart? There should be a sticker located somewhere in the memory compartment. Probably you’ll find it under the memory. This sticker has motherboard part number. Find the part number and google it. 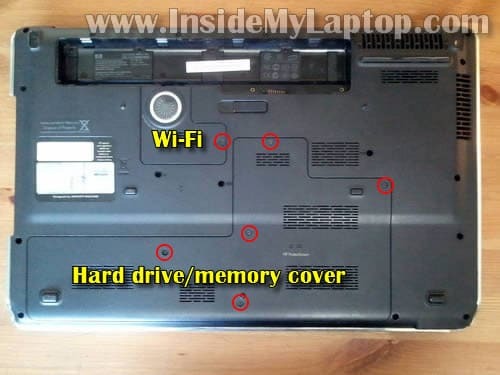 I found this guide very useful, but i have one issue with my laptop. The system detected that a cooling fan is not operating correctly. Continued operation is not recommended and may cause unpredictable bhavior that could result in random shutdown, data loss, or possible system damage. The system will shut down in 15 seconds. To prevent shutdown and continue operation press the enter key now. Could you please help me. The laptop is only one year old. I bought this computer new. Two weeks ago I took the laptop to a the service for a dust cleaning. After three days it started to give this message. It’s possible the cooling fan failed. Turn on the laptop and listen for the fan. Does it spin at all? Does it show this message as soon as the laptop turned on or after a while? It’s possible they forgot to connect the cooling fan back to the motherboard after the cleaning. Maybe you should take it back to the repair shop and ask them to fix it. I am having some trouble with step 23, I cannot figure out how to remove the four ribbon cables, can someone help? I am stuck on step 23. How do I remove these cables. Can you provide more detail please? I’m afraid I will break them. Look at steps 7 and 20 in this guide. I have a DV7-3167 with a damaged HDMI port and possible damaged memory card reader. Do you know the HDMI port part number? if the card reader is damaged is that replaceable and if so the part number? Hi, is it normal that the plastic zone below the hp logo, where is the display inverter gets hot when you select maximum brightnes after awhile? It happens in your dv8? I need to replace just the LCD video cable and I already have the replacement part with me. 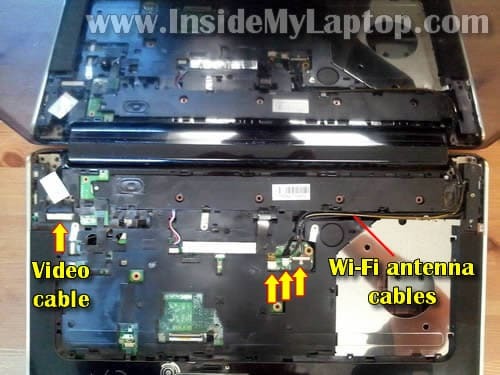 I saw a bunch of screen placement videos for similar laptops, but couldn’t find any tutorial for the video cable replacement. Is there a simpler way to replace the cable or will I need to disassemble the screen? If you can provide any help, I’d greatly appreciate it. Thank you! What? Look at the guide again. 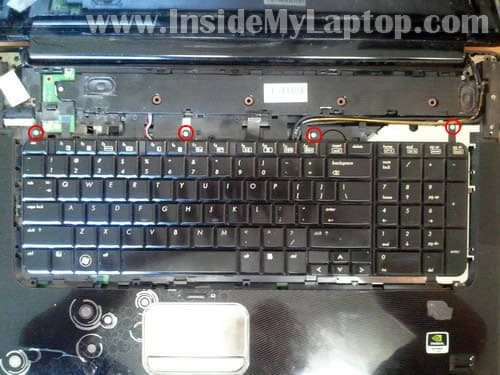 It shows step-by-step how to remove the top cover assembly. Also, look in this service manual for HP Pavilion dv8 notebook. who much i can increase the ram please? HP Pavilion dv8 notebook can handle 8GB. You can remove the 2GB RAM module and replace it with a 4GB RAM module. For best performance, you should have identical memory modules in both slots. In this case the laptop shuld run in dual-channel mode. 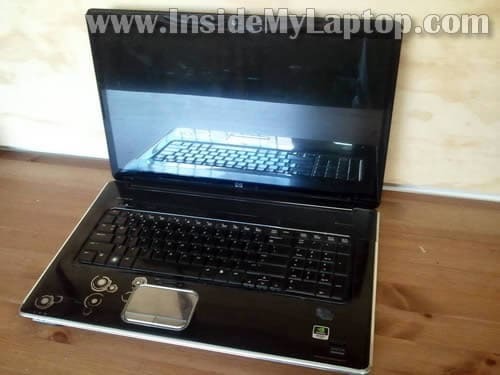 I have a HP Pavilion DV8 1200 with 2 HDD. I changed the drive 2 with a SSD drive. Is there a bios option to switch the boot order form HDD to SSD? Why did you install SSD as a secondary drive? I would try installing it as a primary drive. After that it should be detected by the BIOS automatically. It takes appox 15 min to start win. Next step is to change motherboard if not anyone have a better suggestion? If you tried replacing the hard drive and getting the same error, probably this is controller related issue. Also, could be defective hard drive cable. Not likely but possible. HP Pavilion dv8 can support up to 2 internal HDDs, correct? 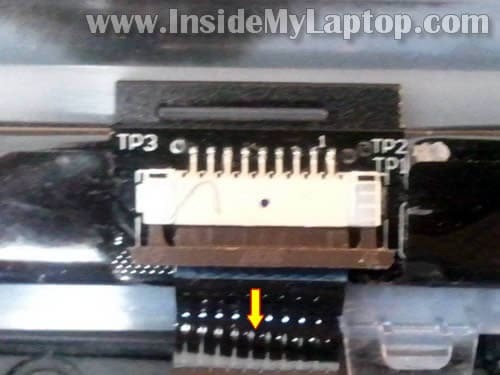 Try connecting the primary HDD to the second connector and run diagnostics. Does it fail this way? 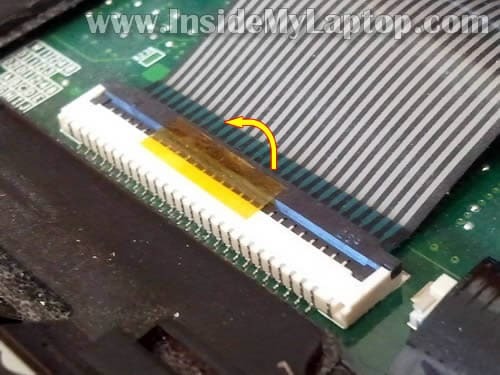 If the hard drive passes test on the second connector but fails on the first, this is the motherboard related issue. Could be defective connector or bad HDD controller. Hi i have the dv8 but the problem i have is that every now and then the volume starts to go up and down by itself and like the treble and bass aswell. Has anyone got an idea of what this problem could be?? Awesome… just replaced a motherboard and your instructions were invaluable. Check your paypal account. please i need to buy the side plate, of the DVT 1100, i let my notebook fall , and i can’t found that part of the side, the metallic part, aluminium i dont know the bolth side are broken !! please help somebody please ! Hi…I followed your instructions and took the computer apart to replace the fan assembly because the computer had died from overheating and would not stay on for more than a few minutes at best (so I figured that was the problem because it also got super hot immediately after turning it on). I put it back together except for the screws on the back side (other than the audio), just to be safe in case there was a issue, and lo and behold the power button does not turn the computer on. I double checked the cable from the Bezel and it seems to be inserted and stable. The only other possible issue is the cable to the keyboard, as I couldnt seat the brown connector tab correctly (it had fallen off) and i’m not sure the cable is securely in place (this was the most time consuming frustrating step in putting the laptop back together), but I can’t imagine that would affect the computer powering on, unless missing any one connector or not seating a cable tightly could prevent the computer from turning on? The light where the A/C plugs in does light up, so it appears to be getting juice. The light on the front of the computer also lights up but only for a few seconds. I dunno, maybe it’s fried for good from the fan overheat problem and it’s just a coincidence that it won’t power up. Do you have an suggestions? My notebook feels very hot on the bottom and fan makes sick noises. I’m going to replace the fan. I want to make sure that removing the logic board is the only way to do that. Unfortunately, you have to disassemble the whole unit as I explained in my guide. The fan mounted under the logic board and you’ll have to remove it in order to replace the fan. 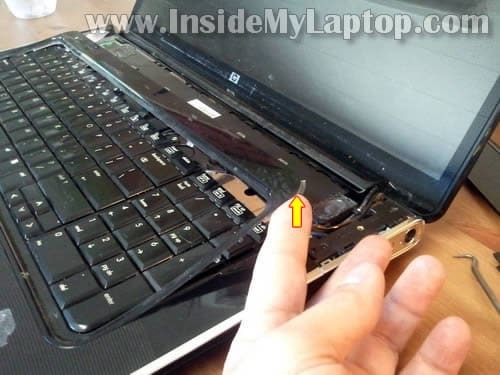 Did you repair it yourself? What was wrong and how you fixed it? Little technical question… 2 years ago, I did upgrade my DV8 from 2x 500gb HDD to 2x 1Tb HDD and it did work fine ! Now… I’ve tried a 2nd upgrade from 2x 1Tb HDD to 2x 2Tb HDD !!! I did try to connect it to an external USB port with an adapter : the DV8 recognizes it ! Can I try to invert connections of SATA 1 and SATA 2 controlers in order to use the SATA 1 controler with the 2nd HDD instead of the DVD writer ??? or any other solution is also welcome of course !!! Apparently, there are some limitations. What if you boot with the old 1TB in the bay 1 and new 2TB in the bay 2? Will it recognize the new 2TB HDD this way? Using a Sata III in bay 1 taking the full speed would ‘neutralize’ the Sata port in Bay 2 ??? Thanks for posting these instruction. I have had my DV8 since my divorce over 4 yrs ago – House I don’t have anymore, but because a good machine is important I bought this. Has been great, but then my charger started to make noises but when I replaced it I noticed the plastic in my power jack broke off. – as had the plastic tab in the right side USB port long ago. I could get by having two USBs but not the loss of power. So this was perfect step by step for a newbie/. I had never done more than swap a hard drive in an old tower before. I made a mistake in step 23 – connectors work so many ways & I did not know the extent… I broke the connector off the board and couldn’t do a successful search for a new one other than to buy machines or MBs to cannibalize. I think it is the power button – 6 contacts in what seems 1.4 inch white connector that I thought slid off two metal prongs, so I pushed in the direction of your arrow. 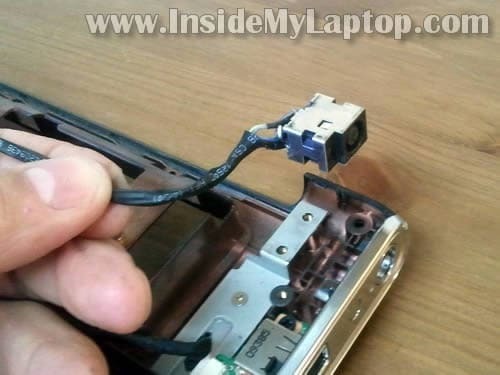 Whoops – that ain’t right – In this case you’re supposed to just yank out the wires/mini flat-cable. After weeks of sitting in parts (with a dust drape) I gave up the search and used a fine needle to set superglue to hold the ‘pressure contact’ down in place. Wish I had a hands-free lighted magnifier for that, but it looks good. I hope I did okay. Tomorrow I try to work these steps backwards. Thanks for the help. Do you have other web class or lessoons, like ‘learning your connectors, or , ‘shade tree fixin man’s computer basics for newbies?’ Thanks for investing your time and effort to help others – that rocks! I got new motherboard for my HP dv8, after installing it, i am not able to install windows 7 from recovery cd, it exist in between without error message. 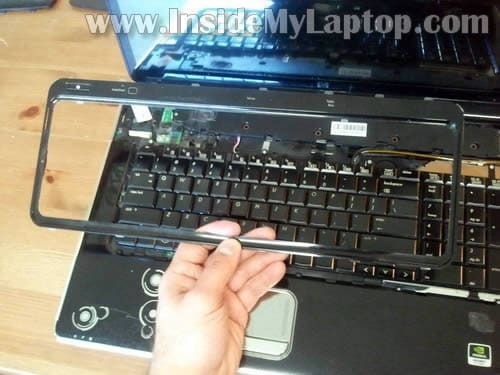 My laptop was working fine for almost 5 years. Now the display remains black very often. I have to open the display in a certain angle to see something on it. This means, that the display is still ok and only some display cables might be loose. You know which cables I should check ? 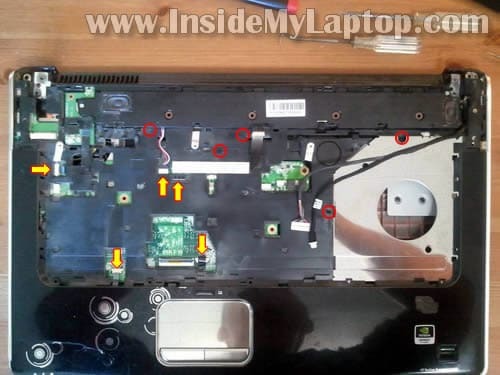 Hi Have used your guide to replace a fried motherboard, After getting everything back together and connecting the power adapter the power light comes on and is steady, but nothing happens on pressing the power on button. Would this be an adapter fault or could it be the dc cable connecting the board is faulty. 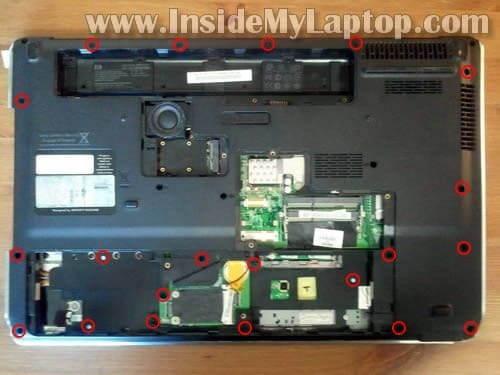 hi, have used your guide to take apart my HP Pavilion DV8 guide, and then assemble it step by step as instructed by your guide, but when i want to switch it on it did’nt turn on. what should I do, please help me. I did all the steps of this tutorial, but at the time of reassembling, the screen stays black, even though it shows that recieves power (Glows lightly), also, if I connect a monitor through the VGA port, it displays the desktop without problems. I’ve been told that might be a problem with the inverter, but so far I couldn’t open the screen case. Do you have a tutorial to open the case as well?